In honor of our recent consecutive victories, GSR&Studie with TeamUKYO is re-opening the 7,000JPY Level figma Course Personal Sponsorship to international fans! Competing in the Super GT with our Hatsune Miku car, GSR&Studie with TeamUKYO is now recruiting Personal Sponsors with this exclusive Personal Sponsorship Course that includes a Racing Miku 2013 Version figma. With the combined illustrative talent of saitom and genius costume design of Mari Shimazaki comes this all new incarnation of the Racing Miku GT Project mascot character - now available in figma form! Outfitted in an exact replica of the unique costume worn by all 2013 "Hatsune Miku Supporters," she includes various interchangeable expressions as well as a grid board and parasols (both opened and closed) - a race track essential for any race queen! And she of course features the flexible articulation of figma, so you can enjoy a wide variety of poses. To commemorate our consecutive victories this season at the Fuji International Speedway and Autopolis, all figma Racing Miku 2013 Ver. will also include a miniature version of each trophy! And, if we win the final race at Motegi on Nov. 3, we'll include one more - for a total of 3 trophies! 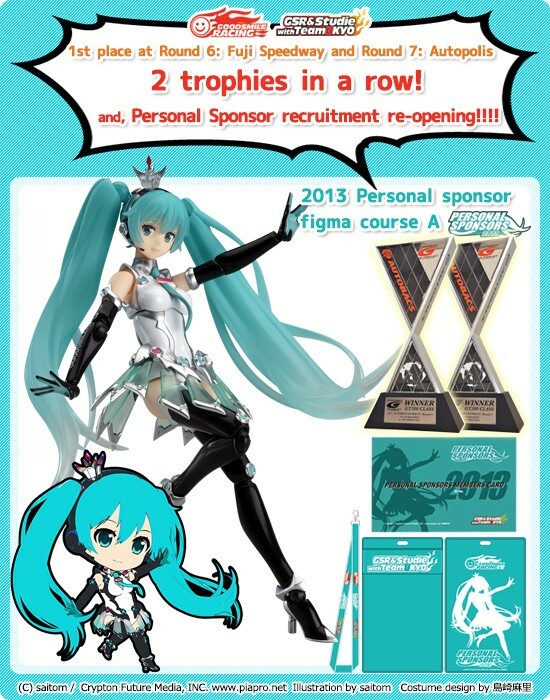 These trophies will be included with all figma Racing Miku 2013 Ver. Courses, regardless of when you completed your application! At this entry level, a Nendoroid Racing Miku design rubber strap will also be included with each course. Registration will be open from (Fri) Oct. 11 to (Tue) Nov. 5 at 23:59 (JST). ・figma "Racing Miku 2013 Ver." *Personal Sponsor Cards and Ticket Holders will only be issued 1 per person. Even if you place more than one Personal Sponsor Course order, only 1 of each will be issued. - Your credit card will be charged upon order, and not when the product is sent.